Last fall, I taught a first year seminar using electronic portfolios, or eportfolios. At the university where I work, I serve as the director of assessment in addition to being an adjunct professor of art history, so I saw this seminar as an opportunity to combine two interests: encouraging meaningful student reflections and creating valuable assessment data, using eportfolios as both the ways and means. 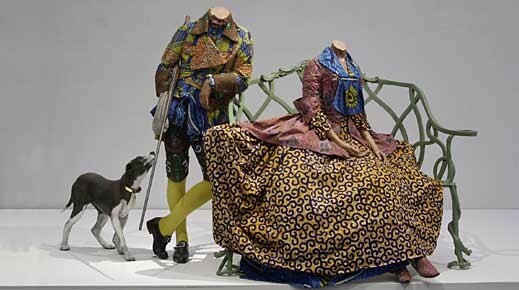 First year seminar homepage for “Race-ing Art History,” featuring Ken Gonzales-Day’s series Profiled in the banner, Thomas Gainsborough’s Mr. and Mrs. Andrews, and Yinka Shonibare’s Mr. and Mrs. Andrews without their Heads. Thankfully, my university already had an eportfolio platform of choice, so I didn’t have to spend any time evaluating systems. Doubly thankfully, I was helping to pilot this program, so this class served as a nice time for me to delve into the platform, learning all of its possibilities and pitfalls simultaneously. Building my course, I decided that in addition to creating my own faculty eportfolio, I should also have a course portfolio. Here, my syllabus became interactive, innovative, and fluid. Students would visit the course portfolio for weekly assignments, readings, and even a page featuring co-curricular classmate events. When a pertinent article came up in the newspaper, I could add the link into the appropriate weekly reading without sending out yet another class-wide email. Besides the fluidity the portfolio’s adaptability allowed me as the instructor, the course website also encouraged (and amicably coerced) students to use the portfolio platform before they had even created their own individual portfolios. This increased the technical learning curve greatly. Towards the beginning of the semester, we had a portfolio workshop on the library computers, so that students could begin to build their portfolios. They brought in one of their first weekly reflection pieces and we spent class time uploading it and going through the submission process. They also brought photos and bio statements to upload to and personalize their pages as well. After this point, all reflection pieces and assignments were submitted to me via eportfolios – and likewise, I submitted all feedback, rubrics, and comments to students in the same digital form. Once we had worked out the kinks of the submitting assignments and had learned the platform’s process, this was pretty seamless. All of my grading took place on the internet, so as long as I had wi-fi, I was golden. I cherished the days I went home without piles of bluebooks or boxes of papers and notebooks. Equally, I loved that I could simply “click” through assignments and reflections rather than going through a much bulkier Dropbox-type collection of Word docs that all have to be opened, saved, reviewed, and re-uploaded via my own computer – rather than simply doing it all in cyberspace as eportfolios allowed me. Students wrote weekly reflection pieces, prompted by their assigned readings and the “questions to consider” I posed for them. Students also submitted annotated bibliographies on a potential research topic, drafted shared group portfolios on an assigned artist, and wrote a mini-grant proposal for further research they were considering. The group portfolio project was especially fruitful and rewarding, as students were able to come together during class workshops to work in and design a shared virtual space. Here, I combined three assignments in one so that the group portfolio fulfilled three functions: it served as a virtual poster board presentation (complete with all the same headings in a standard poster presentation), it served as the written project that would normally accompany a poster presentation (complete with the written formal analysis, citations, and bibliography), and it served as the digital presentation so that students did not have to create an entirely different PowerPoint presentation to go alongside all of their other work. The eportfolio allowed them to do it all in one neatly packaged online resource. At the end of the class, I was able to download all of the quantitative rubric data from the assignments, which I mined for helpful hints in assessing my own teaching. I not only found clear ways to improve the class for the future (consistently lower performance areas), but I also saw certain assignments that could use clarification (distinct and unique drops in performance on a single assignment). Both of these insights were new to me – as I could not see them without the numeric data to back it. However, it was in the qualitative data from the portfolios that I really felt the class’ significance and saw the students’ overall growth. Numerically, I could ensure that students had grown from the start to finish of the course, but verbally it was so much more powerful to hear it from the students’ voices. For my class’ last reflection assignment, they were to go back and read their prior nine reflections. 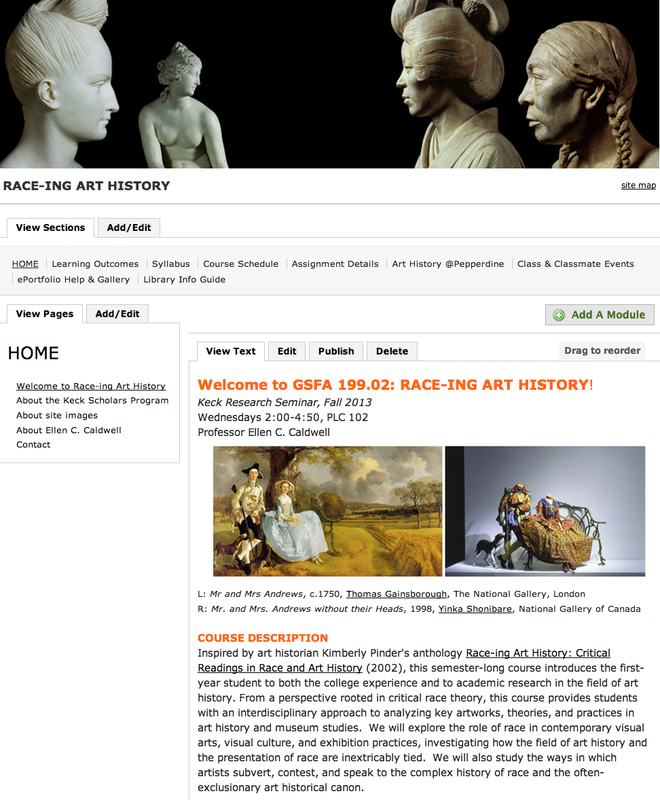 This specific course was entitled “Race-ing Art History,” inspired by Kimberly Pinder’s 2002 anthology. From a perspective rooted in critical race theory, we explored the role of race in contemporary visual culture and exhibition practices, investigating how the field of art history and the presentation of race are inextricably tied. 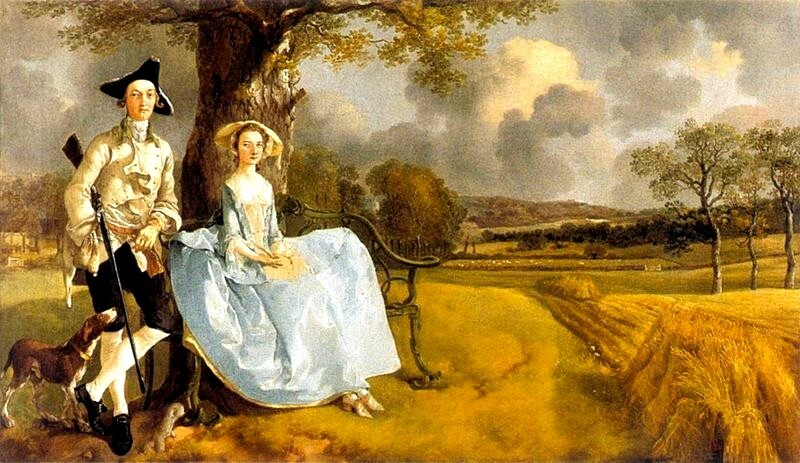 For many of my students, this was the first time they were discussing either art or race (much less both) in an academic setting. In this sense, the reflection pieces were key, as they captured iterative moments of growth during the first semester of the students’ college experience. Reading their final reflections, I saw students coming to concise and eloquent revelations about the changes in their attitudes and critical thinking skills. Students even quietly admit that they feared they had been closeted racists, after quite literally reading through and tracking their growth since the beginning of the semester. To me, the reflective process eportfolios allowed was and continues to be priceless. There is something different in having the words typed and displayed directly on a portfolio page, than having it within a Word document on a computer file or thumb drive. The openness a portfolio allows with its public display and easily accessible form, encourages re-visiting, and another layer of growth that is not often there with the dropbox mentality behind other learning management systems. With these learning portfolios, it is easier to reflect upon work again and build that reflection into part of a process, so that the learner can see and summarize changes, growth, and lessons learned throughout the course of a semester – and hopefully beyond.